Typically most products are in-stock, with items shipped within 1 business day. We ship worldwide. 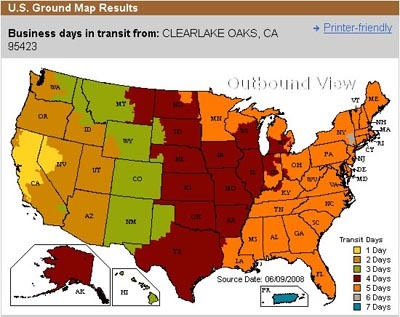 Domestic U.S.: Shipping is normally via UPS Ground Insured within the lower 48 states, and via USPS to Hawaii, Alaska, Puerto Rico, protectorates and APO/FPO addresses. To ascertain shipping costs, simply place items in the shopping cart and then select the Estimate Shipping button. Enter shipping details and you will see a list of shipping options and prices. You can add/subtract items and recalculate. Limited time offer, free shipping on all orders over $398 via UPS ground in the lower 48 states. View the UPS shipping chart below. International: We have many International customers, and ship via the United States Postal System (USPS) or United Parcel Service (UPS). For more info on shipping times and costs, currency, customs, etc, see our section on International Orders. Returns and Defective Merchandise: While it rarely happens, if you receive merchandise that is defective, please contact us via email or by calling 707-998-0135. If contacting via email, it is helpful to send a photo of the problem along with your name, phone number and shipping information. We will contact the manufacturer to get replacement parts. Returns are accepted within 14 days with a 15% restocking charge - buyer is responsible for return shipping costs. Refunds will be based on the purchase price less shipping. Please contact us beforehand, as unsolicited returns will not be accepted. Returned products purchased during a "Limited Time Free Shipping Special" will also be subject to actual shipping charges - refunds will be made on the purchase price, less actual shipping charges and the 15% restocking fee.